What do moms do for their kids? Everything possible to help them thrive, right? Check out this info from the Young Living blog on tips for “Dr. Mom”! How do you show love to the children you care for? Comment below! What are the April Young Living Specials? I’m so glad you asked! Are you ready for spring cleaning? Ready to jump in? Let’s get you started now – Click Here to learn more about Young Living. Questions? Email me at goodhopebloggers [@] gmail [dot] com. I’m always looking for natural ways to support my well-being. Surviving cancer has taught me many things, and one of the most important things is that we need to take care of our bodies. One way we can do that is using natural (100% pure) products. Essential oils makes sense for my lifestyle. The more I learn, the more I realize how important they are for my personal goals. I came to the conclusion that Young Living is a logical and important next-step for me and my family after finding help for symptoms from chemically-induced menopause in 2011 from going through chemo and radiation for colon cancer. I believe there are other women who may have gone through a similar challenge and need to hear what I have to share. So now I am incorporating essential oils in our home and loving these plant-based alternatives to chemicals. 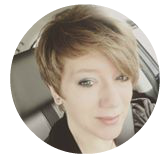 I want to share a few facts with you about essential oils and Young Living. In humans, essential oils provide support for every system in the body – from the endocrine system, to the circulatory system, to the muscular system. They support brain health, a healthy weight, are wonderful for supporting your emotional health, and are even great for sprucing up your libido! If you’ve gone through chemo and radiation, you understand the challenges these medical treatments can cause in the name of saving one’s life – let alone menopause! The uses for essential oils are endless. Some of the oldest cultures on earth used essential oils. The Egyptians used essential oils for beauty and embalming and they were used in communal bath houses in Pakistan and Rome. There are 188 references to the use of essential oils in the Bible. Today, essential oils are considered by many to be the leading edge of natural products. Old things do come back in style! Oils can be applied to skin (topically – this is the way the English typically prefer), diffused in the air (aromatically – this is the way Germans tend to enjoy), added to your bath, and Young Living’s Vitality line can be added to food and drink (the French tend to use essential oils more in cooking). When I was in a hospital bed after surgery to reconnect my colon a friend came to pray for me, visit, and massaged my feet with lavender essential oil. It was a lovely and refreshing blessing when I was feeling very low. Today? I love Lemon Vitality oil or Lemongrass Vitality oil in my water bottle with a few drops of stevia. Water is so important to our bodies – and this is a great way to drink more water! #4: Essential Oils Are POWERFUL! Essential oils are the most powerful part of the plant. They are distilled from shrubs, flowers, trees, roots, bushes, fruit, rinds, resins, and herbs. Oils consist of over 100 different natural, organic compounds. When they are applied to skin, they are absorbed easily and carried by the bloodstream to every cell in the body within minutes. They can increase oxygen uptake, enhance absorption of nutrients, enhance longevity, and help our bodies detox. Inhaling therapeutic grade oils can uplift our mood and increase our feeling of peacefulness and well-being. Tests have shown that essential oils reach the thyroid, liver and heart in three seconds when inhaled. They were also found in the bloodstream in 26 seconds when applied topically. A normal and healthy body metabolizes essential oils in about 3-5 hours. 60,000 rose blossoms provide only 1 ounce of rose oil, making it one of the most precious and expensive oils on the market. However, Lavender is abundant – 220 pounds will provide 7 pounds of oil. The amount of plant material required for distilling explains why some oils are more expensive than others. And yet, since we only use a small amount of essential oils at a time, even oils that are expensive are often considered to be very economical. They last a long time! #7: Purity Is highly Important! In the United States there is no true rating system for essential oils. The closest we get is an FDA requirement that in order to label a bottle of essential oils “pure” or “therapeutic grade,” the contents of that bottle must contain at least 5% of essential oils. When using essential oils as a natural alternative to support health and wellness, purity is absolutely critical. 95% of the world’s essential oils were created for industrial use. Many of the oils found on the market and in local stores are of low quality. You will want to know the source of your oils. That’s one reason I trust Young Living. 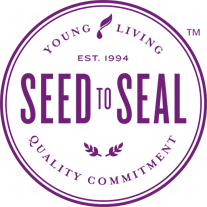 Young Living offers a Seed to Seal Guarantee – and this spoke volumes to me as a cancer survivor. Young Living grows their own plants, owns their own fields, works closely with partner farms who abide by the same policies, and controls the entire process from planting all the way through until bottling. If I am going to go the extra step of using essential oils in my home, I want to be using the very best. The Seed to Seal Promise means each plant is hand-weeded (oh my heart… all that weeding?! ), there are no pesticides used, no chemicals, and no weed killers. The plants are harvested at their peak and vigorously tested. They go directly from the farm to my home! You can read more on Seed to Seal here. Using therapeutic grade essential oils and oil-enhanced products every day can help us lead happier and healthier lives. God did not create us to just survive – He created us to thrive and live life to the fullest! I feel that essential oils add an exciting natural resource in my personal wellness tool-kit. How have you incorporated essential oils into your life? If you haven’t yet, perhaps you are curious? Click Here to learn more! Let the adventure begin. There is a SWEET new Young Living promotion for March 2017 I’m here to tell you all about!!! As a reminder about how the monthly promotions work, if the PV (the point value of your order) of a single order reaches one of the tiers (100, 190, 250, or 300PV), you will receive the items at that level FREE with your order. Any items designated as ‘Essential Rewards Exclusive’ are only available on monthly Essential Rewards orders. If you order at least 100PV through the Essential Rewards program in March, you will get a FREE 5ml Lime Vitality essential oil! We LOVE adding a drop of Lime Vitality to our guacamole!!! Yum! 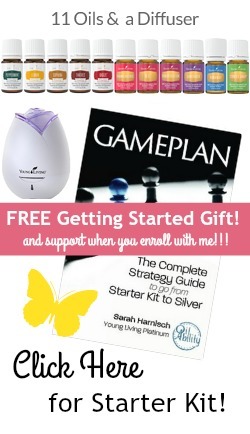 If you still have not taken the plunge into the essential oil world and ARE READY TO (WOOHOO! ), hands down the Premium Starter Kit is the best way to get started and to save 24% on all your essential oils and oil-infused products. Happy March!! It will be SPRING in just a few short weeks!!!!!! !